Thinking, Fast and Slow is one of my favorite books. In it, Daniel Kahneman details how the human mind works in two modes: one fast and effortless, the other slow and laborious. You engage the slow system to split the check among three friends. The fast system works automatically, filling in blanks and recognizing patterns. It allows us operate smoothly on partial information. However, that quick judgement system can also lead us into dangerous biases and overconfidence. 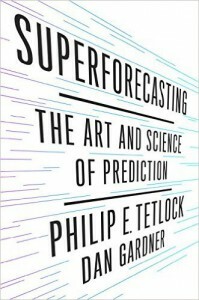 In Superforecasting: The Art and Science of Prediction, Tetlock and Gardner apply the principles of behavioral economics to the practice of forecasting. Tetlock is the researcher whose previous studies led him to conclude that most expert prognosticators predicted future events no more accurately than dart-throwing chimps. Tetlock led a major prediction effectiveness study called The Good Judgement Project (GJP). Tetlock and his co-researchers enlisted several thousand volunteers as contestants in a prediction competition. To be statistically meaningful, contestants had to make hundreds of predictions. They were of the sort… Will Scotland vote to secede from the UK? Will the Swiss examination of Yasser Arafat’s exhumed bones find traces of polonium? They established a system by which competitors were scored based on a combination of correctness and confidence level. They identified the top 2% as superforecasters. These people consistently predict events with much higher accuracy than everyone else. You might expect that intelligence is the primary factor that sets the superforecasters apart from the rest, but while they were of above-average intelligence (top 20% of the population), it was the superforcaster’s ability to stay objective, counteract their own biases, and question their own beliefs that make them different and so effective. In large part, they were better at avoiding the biases identified by Kahneman. To learn what each of these traits mean and how superforecasters manifest them to make significantly better predictions than their peers, check out the book. It’s like Thinking Fast and Slow applied to prediction with a heavy dose of The Black Swan, The Wisdom of Crowds, and Mindset. It was a great read/listen, and I highly recommend it! D3 is amazing. Once I saw a few demos I knew I had to learn it, but what should I build first? It’s always more fun to solve a real problem. It hit me that a truly visual, data-driven resume for developers is way overdue. I’d found my project. You can see a working demo here and the source here. The rest of this post describes the basics of how it’s put together. I found a promising project called JSON Resume, which made a great starting point for an interactive, data-driven presentation of developer experience. This nifty project defines a standard JSON schema for the contents of a resume. It lets you define the content of your resume as a JSON document, then you can apply any kind of presentation to it. See a nice gallery here. I added a section to each work experience entry for projects. Each project has a name, description, start and end dates, and arrays of roles, languages, and tools. This is the detail that enables all of the visualizations and interaction. I liked the Kwan theme. I converted it from Node and Handlebars to AngularJS. This gave me a good starting point to build around. Before I build any of the charts, I had to iterate through all of the projects, sort chronologically, and allocate timespans to each language and tool. I then build the data structures each of the charts expects. To show the career timeline with the various roles typical developers play, I started with d3-timeline. I had to make only minor tweaks to adapt it from hours to years. These was a nice hover feature that I used to show the relevant project at each time point for each bar. An area chart communicates the flow of skills acquisition over time. This shows more than the typical “X years of Y” table and shows how the experience was gained over time. I added filters so you can limit just to particular roles. The layout and graphics could use a designer’s touch. I think libraries should be broken out from tools. We can probably make better use of project descriptions. There is room for enhancing the JSON Resume to describe more detail about the strengths of the developer and the kinds of teams and roles sought. I think this is just scratching the surface of how interactive graphics can tell the story of each developer’s experience and direction. The code is on GitHub. Try it with your own resume. It doesn’t take a lot of math to understand machine learning, but you will need some calculus and linear algebra. If you haven’t covered these or it’s been long enough that you need to brush up, there are great free options out there. The excellent Khan Academy covers Linear Algebra, Differential Calculus, and more. Khan is an incredible resource, but if you are intimidated by calculus or just prefer a methodical pace that allows you to develop intuition about the concepts as you go, I highly recommend Jim Fowler’s Calculus 1 Coursera course. 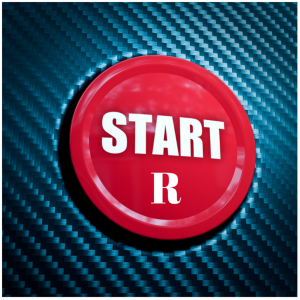 You’ve got R and R Studio installed–now what? If you are more of a book-learner, I’ll give you some places to start in the next post, but we’ll start with the MOOC space. There is a lot of new content coming all the time; so all I can give you is a snapshot as of February of 2015, but I’ll provide updates occasionally. 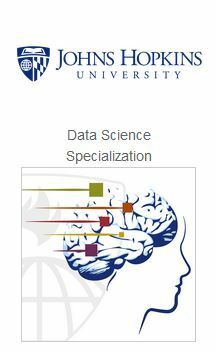 Put together by three professors from the Johns Hopkins University Bioinformatics program, the Data Science Specialization from Coursera is nine 4-week courses on R and Data Science. As of this writing, I’ve taken R Programming, Getting and Cleaning Data, Statistical Inference, and Practical Machine Learning. Consistent use of R. You will become pretty proficient with R just by taking a few of these courses. Nice combination of video lectures, quizzes, and practical projects. Popular courses with active discussion groups during class offerings. Coverage of topics like statistical inference and machine learning not in-depth enough to be called anything other than surveys. Some of the content and assignments appear to have been rushed and not well edited. The profs don’t interact on the discussion boards. Machine Learning by Stanford’s Andrew Ng was one of the earliest and most popular courses on machine learning. This course goes into enough depth for you to not just use machine learning as a black box, but to understand how and why it works. That level of understanding comes with a caveat: you’ll need to remember a bit of your college calculus and linear algebra (although Ng provides an optional section on the linear algebra you’ll need). 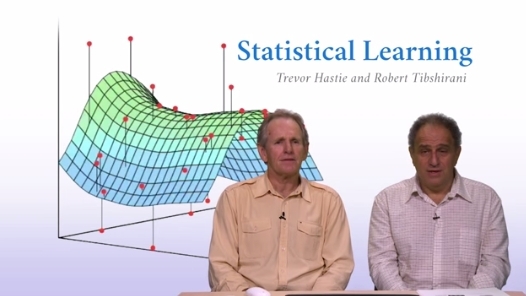 It follows the professors’ excellent text Introduction to Statistical Learning with Applications in R.
The lectures are well-produced, featuring a nice combination of seeing the professors and the supporting graphics. Much more in-depth on machine learning than the Data Science Specialization. Udacity offers some machine courses that look pretty good, but to access the course materials and exercises (which is necessary to really learn), you must use the paid version which is pretty expensive. Also check out Pedro Domingo’s Machine Learning course. Data Science in the Cloud with Azure ML and R is a short eBook that steps you through building a model and deploying it to Azure ML as a Web service. The book assumes you already know how to use R; so, it’s not the best starting point if you are new to R. However, I’d go ahead and pick up the book. It covers the critical area of how to deploy a model once it’s built. You’ve chosen R as your tool for getting started learning data science and machine learning. If you are coming from a background on the Microsoft technology stack, your decision to choose R was affirmed by the recent announcement that Microsoft acquired Revolution Analytics, a leader in the R world. Download and install R from CRAN, The Comprehensive R Archive Network. You’ll find installers for Mac, Windows, and Linux. I’ve installed on both Mac and Windows. They are both simple and straightforward. Next, download and install R Studio. Even if you are a command-line person who thinks that IDEs rot the mind and inhibit true learning of a new language, trust me–you will still be writing R code in a Notepad-like experience and the integrated help, plots, and data views make R Studio a must-have. 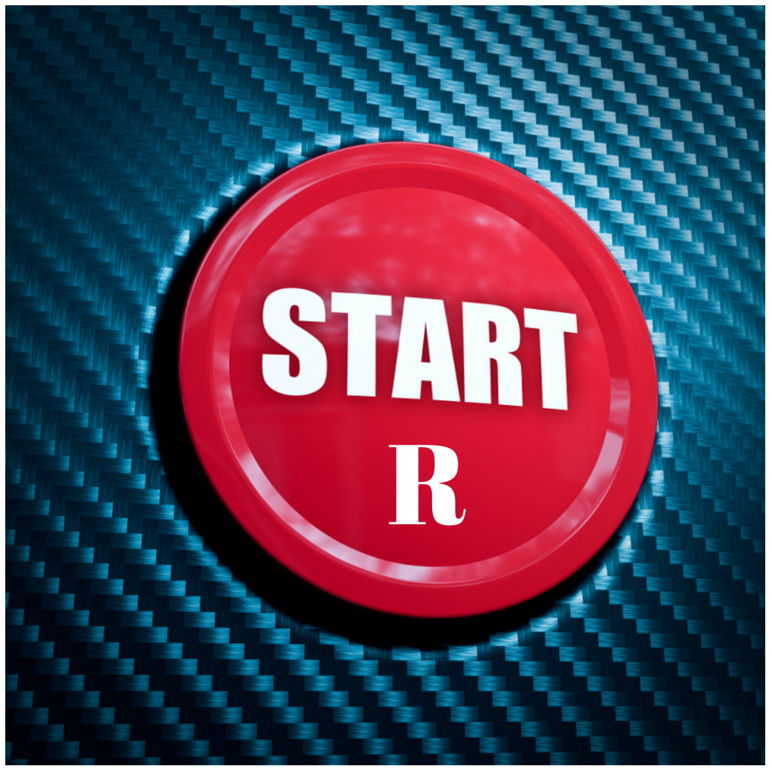 Just like R, R Studio is a a straightforward instal on Mac or Windows. While you’re at it, download a copy of Introduction to Statistical Learning with Applications in R and The Elements of Statistical Learning. Two of the best data science books on the R platform are made freely available by the authors in electronic format! One of the first questions I confronted when setting out to learn Data Science was what platform to use. As you begin to look at books and courses you realize that you’ll need a basic platform for working with data. Think of it as an IDE for data manipulation, statistics, and algorithms. For example, if you take Andrew Ng‘s popular Machine Learning course, you’ll be doing the exercises in Octave. If you take the machine learning course on Pluralsight, you be using ENCOG. 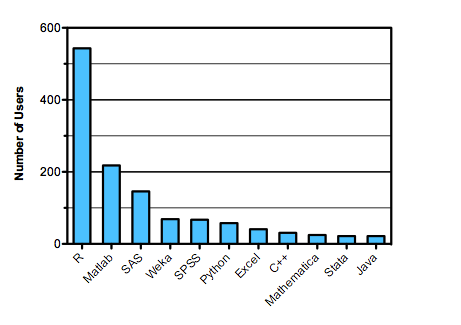 Python is the most popular general purpose programming language in the machine learning world. 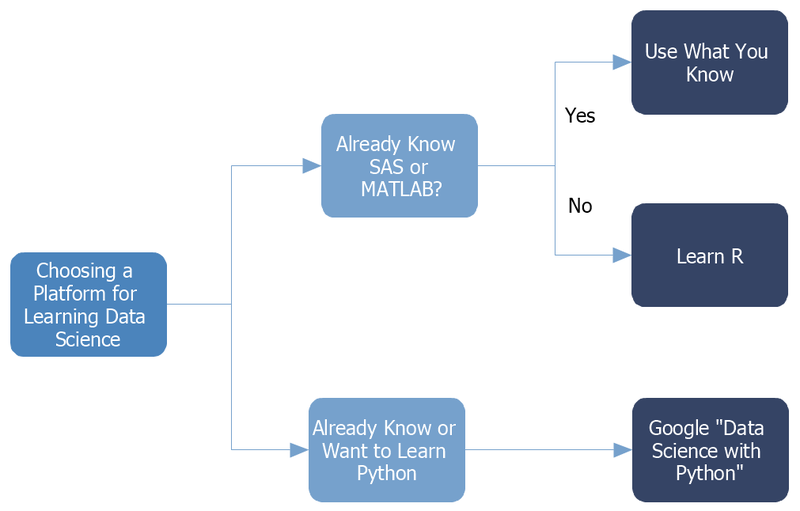 I’m not a Python guy (yet), but you can start at SciPy and go from there. I initially started working through Andrew Ng’s course, but I wasn’t sold on spending a lot of time learning Octave. I had a Data Mining book with all the exercises in Weka, but I wasn’t loving that idea either. I kept hearing about this statistics language called R. After some investigation, I found that the R language is nothing to write home about, but R Studio and the vast collection of available packages make R a great choice. Bottom line… if you have an tool that makes sense for you, then use it. Otherwise, start with R.
Extracting meaning from data is nothing new, but the world has really woken up to the value of predictive analytics and machine learning… preference and recommendation engines, effective marketing, spam filters that actually work, better medicine, even self-driving cars. This new focus has created a scramble as companies have tried to find people with the skills needed to get them into the predictive game. This scramble has led to two problems: 1) what, exactly am I looking for (not just programmers and not statisticians), and 2) where are these people? 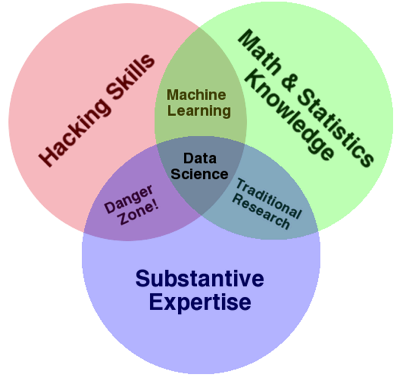 The world has settled on the terms Data Science and Data Scientist. HBR famously referred to the Data Scientist as the sexiest job of the 21st century. I like the term because its practitioners are applying the scientific method while working in the medium of data–creating and validating hypotheses, making discoveries, and improving life in myriad ways. The data is not sitting in nice, neat SAS datasets. It’s in unstructured social media networks, streaming off of sensors, or in various other messy forms. The machine learning algorithms bringing the breakthrough innovations are more computational than mathematical. Implementation of the insights coming from the data require significant programming. Programmers don’t normally think in terms of designing and executing experiments. They must understand what data these experiments require and what can be inferred from the data. The big data aspect requires specialized skills in distributed computation. Hype and cynicism aside, the world needs more technologists that can program, handle data, and have a mastery of inferential statistics. There is an incredible need and the work is intellectually stimulating. This has motivated many developers to learn to be data scientists, myself included. Next up… approaching the data science field as a developer. It was just over a year ago when I started talking to small company in Columbia, SC about heading up their Engineering team. They were a .NET shop–right in my wheelhouse. All I had to do was pick up the insurance domain and figure out what predictive analytics and machine learning are all about. Technically, I didn’t have to understand machine learning because the company has a core research team that develops and maintains algorithms. I would lead the team that turns those algorithms into great software solutions and user experiences for the insurance industry. Of course, no engineer worth his salt is going to be content to treat the heart of his system as a mysterious black box. So, for me, taking the job meant diving into machine learning, which I knew nothing about. As I spent the previous five years building mobile and web field service automation solutions, I knew “big data” was a hot topic, but I had missed the rise to prominence of predictive analytics and the whole Data Scientist craze—the sexiest job of the 21st century. I’ve spent two and half decades filling in the red circle. As a Domain-Driven Design adherent, I’ve always committed myself to learning the domain my software is designed for—in this case insurance. However, I hadn’t given serious thought to higher math and statistics beyond batting averages and occasionally having to remind myself how obscure three sigma outliers are. 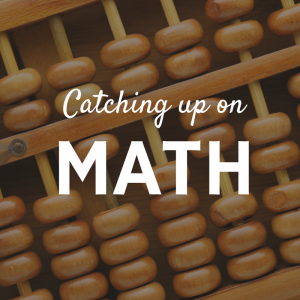 I enjoyed these subjects in college, but left them behind as i built systems where the most complicated math could be done by a middle schooler. Sure, cryptography has some interesting math, but we rely on libraries for that. I’m going to use this space to chronicle my journey from a transactional business system developer to a data scientist—or at least a machine learning/predictive analytics specialist. I’m early in the journey, but I’ve made enough missteps as well as positive steps that I can help others looking get into the predictive analytics space.